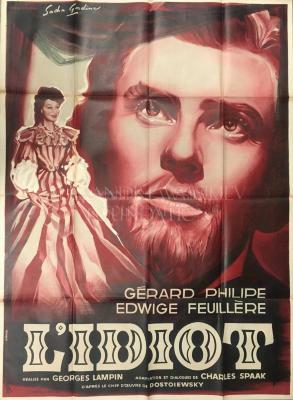 Original large format publicity poster for "L'Idiot" ("The Idiot"), 1946 French drama film directed by Georges LAMPIN and starring Edwige FEUILLERE, Lucien COEDEL and Jean DEBUCOURT. It is an adaptation of Fyodor DOSTOEVSKY's novel The Idiot. The film's sets were designed by Léon BARSACQ, credited as the art director.